IMPORTANT: You can not use two pins on one line simultaneously. 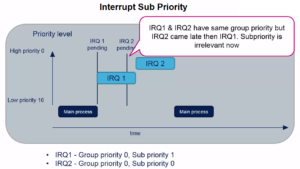 ATTENTION: in reality in the Cortex-Mx (STM32) we don’t have 16 external interrupt line, normally there are many less. 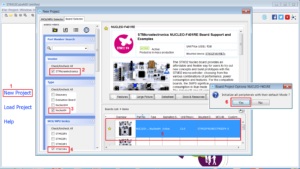 See the reference manual of the STM32 family that you need to use. 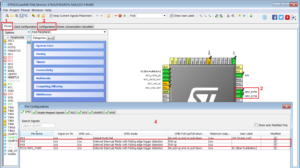 STM32F4 has 7 interrupt handlers for GPIO pins. 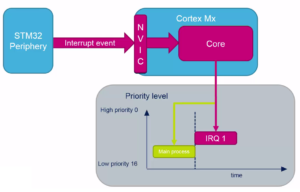 The NVIC is designed for fast and efficient interrupt handling; on a Cortex-M4 you will reach the first line of C code in your interrupt routine after 12 cycles for a zero wait state memory system. This interrupt latency is fully deterministic so from any point in the background (non-interrupt) code you will enter the interrupt with the same latency. Multi-cycle instructions can be halted with no overhead and then resumed once the interrupt has finished. 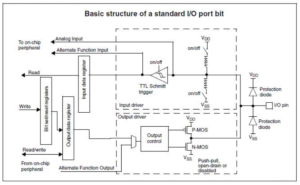 The External Interrupts are handled by the NVIC (nested vectored interrupt controller) peripheral. 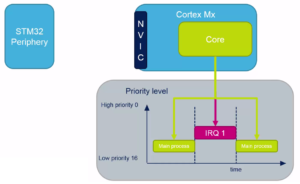 If comes an interrupt, NVIC handle it and the Cortex-Mx core suspend the MAIN PROCESS and respond to the IRQ1. 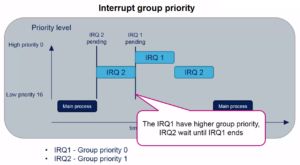 At the end of the response at IRQ1, the core back to the MAIN PROCESS at the exactly position where it whas suspended before. 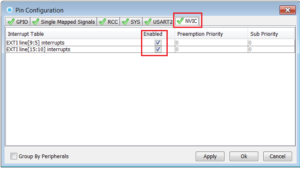 NVIC is the arbiter that decide the execution of interrupt based on the priority and sub-priority of the interrupt. The priority below is available on M3 and M4 and on M7 there are even more possibilities. Now we will show how to configure two GPIO in Input in Interrupt mode. For do this test we use the NUCLEO-F401RE board. All is developed using a free tools that are: CUBE-MX and ATOLLIC compiler. First run CUBE-MX and select the NUCLEO-F401RE board. Attention, when you select the board NUCLEO-F401RE, at the end will appear a message box like below, plese choose YES (step n.6). Now configure the GPIO PA8 and PA9 as shown below. It’s used for wake up the MCU without generate an interrupt. Now enable the INTERRUPT on PA8 and PA9. 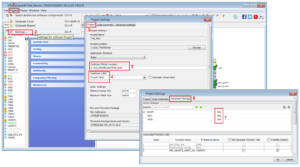 Last but not least, is necessary configure the Cube-MX to generate the code for Atollic, see below. 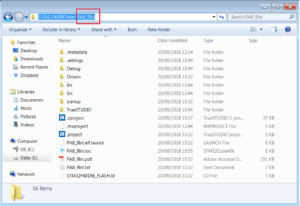 Generate the code and at this point you has a directory where inside there is the Atollic project and the Cube-MX configuration file. 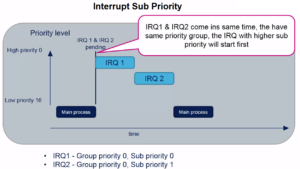 you must see the two functions that handle the external interrupts, see below. * @brief This function handles EXTI line[9:5] interrupts. 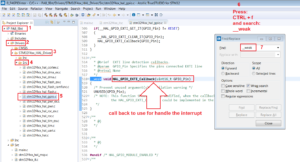 * @brief This function handles EXTI line[15:10] interrupts. there is GPIO Interrupt inizializzation and also the NVIC inizializzation. Now for handle the interrupt we use the call back. Now if you press the Blue Button or connect to ground PA8 or PA9 you see the Green LED toggle it’s status. Of course, for a good work, we suggest to insert a debounce time on all the input pins.